Hillary Clinton…The Woman, The Mom, The Grandmom, The President? How do you feel about the former First Lady’s bid for the Presidency? Do you want to know what other women think and feel about her candidacy? 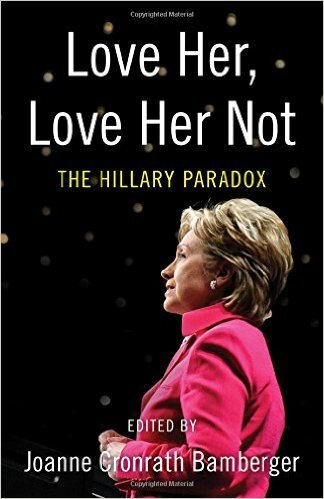 If you do then Love Her, Love Her Not – The Hillary Paradox edited by Joanne Cronrath Bamberger is the book for you. Fantastic book that was given to me by the author and signed in exchange for my thoughts about it. I am honored to do this review for Joanne Bamberger because she has compiled a book about what many accomplished women think of Hillary Clinton. This compilation of essays has touched me by both challenging and supporting what I myself feel and think about Mrs. Clinton and the possibility of her becoming the first female President of the United States, (POTUS)! Hillary is ambitious both personally and politically and undeniably intelligent. It seems most women either fiercely like her or fiercely dislike her. There are few women who sit on the fence when it comes to their feelings and thoughts about the former First Lady. If she is wins the Presidency, the United States will have elected their first woman as POTUS after having elected their first African-American as POTUS. This says so much about our country and how much we value competence and good qualifications in our President and the fact that we are able to look beyond race and gender. Yes, it has taken many years but I think we are there and ready for this milestone. Bamberger’s book has come along at just the right time for me as I have always had my opinions of Hillary swayed by the many contradictions that I have witnessed during her political life. She is my contemporary and that makes me measure her against many of my own experiences during the 60’s, 70’s 80’s 90’s and now into the 21st century. Love Her, Love Her Not is the perfect book for those who desire to know more about Hillary and are curious about what other diverse women think of her and why. It endeavors to answer the question that Lisa Belkin asks on the cover “Why are we so conflicted about her as with no other politician?”. Reading the thoughts of others may help to tease out our own thoughts about why we feel the way we do about Mrs. Clinton and her bid to be POTUS. Who better than women to share their ideas and thoughts concerning Hillary Clinton. Women understand women is what I consistently have found. Although I might not agree with all of these women I loved reading what they had to say. It is my way of searching for the information I need to make an informed intelligent choice when I step into my voting booth next November. I would recommend this book to my friends and others. The time has come for a woman to be President! Learn more about Joanne Bamberger and her book tour. This entry was posted in Grandmas & Grandpas, Moms & Dads, Reviews and tagged book review, hillary, Hillary Clinton, Joanne Bamberger, Love Her, Love Her Not by llpitlwp. Bookmark the permalink. Planned parenthood, and because my husband was with the NSA we believe her use of a private server makes her fit for prosecution. The men and women whose lives in intelligence were compromised because of this is of yet incalculable. She has taken a stand on abortion, and the use of abortion through the third trimester, where the baby is crushed and then dismembered in order to extract from the womb. I believe the democratic platform, which says a baby is not a baby until brought home from the hospital, and that it is a mothers’s right not to save a baby if born alive in an abortion , pledging her loyalty to planned parenthood, disqualifies her as fit to be a president. Many democrats oppose the death penalty. I find that amusing in light of the indifference they show to a baby, a human life. I often wonder the same thing myself. How can you oppose the death penalty yet be pro-abortion? When you view an ultrasound of a growing human embryo how can you not marvel at the wonder of life no matter how small? These are definitely issues that concern me also. I think the book is worthwhile as it shows varied opinions and thoughts about Hillary which give us more of a platform to like or dislike her. I wonder what a book like this would have to say about Trump and Bernie? Thanks Melinda as always for your comments and thoughts.